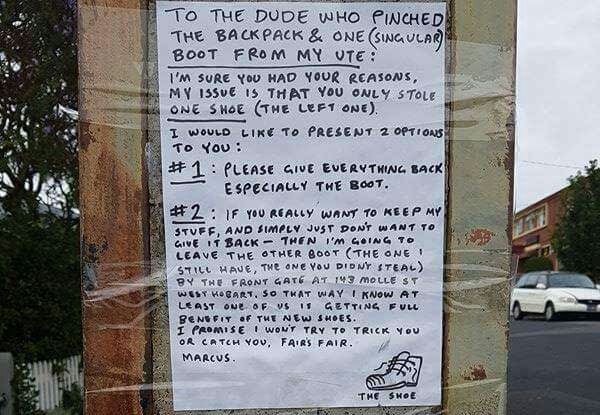 This guy posted an epic note to get his shoe back from a thief. It actually worked. 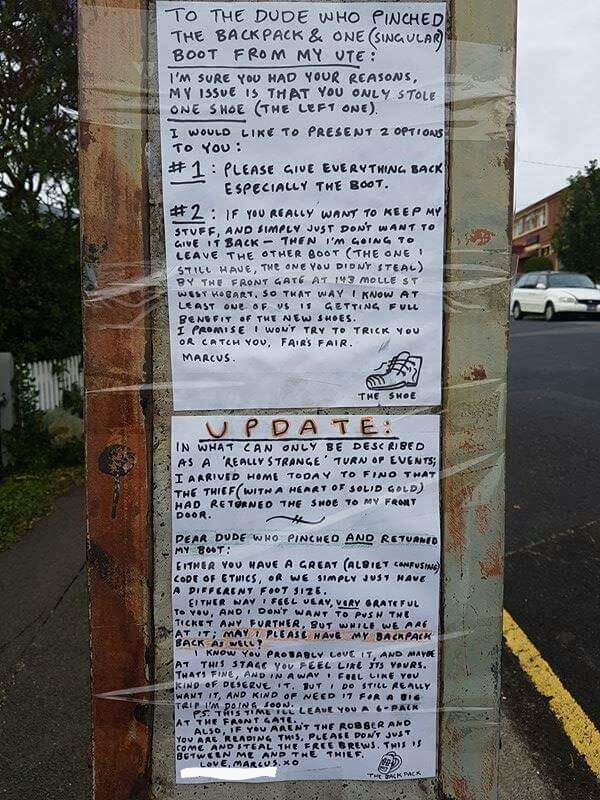 Recently a thief in Australia broke into a guy's utility vehicle, stole a backpack, and strangely also took with him one singular shoe. Who? Why? The owner, Marcus, decided the only chance at answers was to leave a gigantic note for the thief at the scene of the crime. "My issue is that you only stole one shoe." I'm sure you had your reasons,. My issue is that you only stole one show (the left one). #1: Please give everything back especially the boot. #2 If you really want to keep my stuff and simply just don't want to give it back —Then I'm going to leave the other booth (the one I still have, the one you didn't steal) but the front gate at 143 Molle St West Hobart, so that way I know at least one of us is getting full benefit of the new shoes. I promise I won't try to trick you or catch you. Fair's fair. Who gives their address to a thief? This guy. Who offers up his other shoe so they don't go to waste? Also this guy. Despite the fact that giving your exact coordinates to a known thief is the #worstideaever, it actually worked. 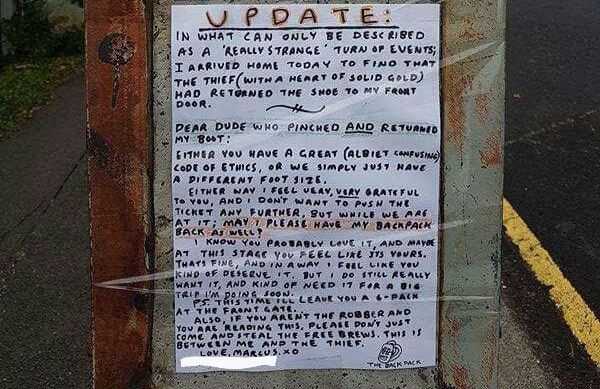 The thief saw the note, paid a visit to Marcus's house, and returned the shoe. Blessed be. But that wasn't enough for Marcus, so he left ANOTHER note. "Dear dude who pinched and returned my boot:"
In waht can only be described as a 'really strange' turn of events, I arrived home today to find that the thied (with a heart of solid gold) had returned the shoe to my front door. Either you have a great (albeit confusing) code of ethics, or we simply just have a different foot size. Either way i feel very, very grateful to you and I dont want to push the ticket any further, but would while we are at it, may I please have my backpack back as well? I know you probablu love it, an maybe at this stage you feel like it's yours. Thats Fine, and in a way, I feel like you kind of deserve it. But I do still really want it, and kind of need it for a big Trip I'm doing soon. PS. This time I'll leave you a 6-pack at the front gate. Also, if you rent the robber and are just reading this, please don't come and steal the free brews. This is between me and the thief. Marcus, you seem like a really nice guy, but you just gave a thief as well as your entire neighborhood your address and the info that you are planning to be out of town. Do you want to get robbed again? Because this is how you get robbed again.